If you’re lucky enough to live this close to some of the most breathtaking beaches on the west coast, you need to have all your curves in just the right places during every month of the year. Because even when it’s not the middle of August, Huntington Beach residents still maintain their summertime, laid-back style. But, if you’re one of the many Southern California men and women have loose and sagging abdominal skin or pooches caused by separated abdominal muscles, luckily, there is a surgical treatment for these conditions called a tummy tuck! Also known as abdominoplasty, a tummy tuck procedure aims to remove excess skin and fat from around the abdomen. In most cases, the procedure is also used to restore separated or weakened muscles in order to create an abdominal profile that looks more appealing at the beach, at work, out with friends and in intimate situations. Maintain your current weight, so you don’t negate results with future weight gain. Continue your current diet and exercise routine to maintain your fantastic results. Non-smokers, as smoking can cause dangerous surgical complications or slow down your recovery process. Have realistic results for your surgery, including being well informed that abdominoplasty is not a weight loss procedure. Postpartum women: Women living in the Huntington Beach area who are in good general health are ideal candidates must commit to maintaining the results of the procedure by following stable diets and a regular exercise plan. And we cannot stress enough that you are finished having children because the inevitable stretched, excess skin and potential for separated abdominal muscles will undo all the hard work you have done. Abdominoplasty procedures are also opted for by women who have undergone multiple pregnancies in a bid to tighten loosened abdominal muscles. Some tummy tucks incorporate liposuction to remove stubborn excess fat that remains after childbirth. Age: The skin loses its natural elasticity as a person ages. Aging has a significant impact on the abdominal area. A flabby and sagging midsection is often the result. Some perceive the prospect as grotesque and begin to feel older than they actually are. Significant Weight Loss: Candidates also include people who have saggy abdominal skin due to losing a significant amount of weight. Such people often tend to become self-conscious because of this, and as a result, often gain back the weight that they had lost. Plastic surgery procedures such as abdominoplasty help them maintain their healthier physique and self-confidence. Genetics: The area where fat accumulates in the body and the shape of a person’s body depends largely on hereditary factors. Excess fat may not be due to inactivity. Procedures such as abdominoplasty and liposuction rectify this problem. This particular procedure involves a large surgical incision that is made in a straight line between the hip bones. Minor liposuction may be needed to get rid of excess fat before Vu tightens the muscles in the abdomen and seals the incision. The belly button is repositioned at the end since a large part of the skin needs to be removed. The recovery time is usually 2 to 4 weeks. Initial recovery stages might require patients to stay overnight in the hospital. They might also be prescribed medication to manage any pain and discomfort. The traditional or standard tummy tuck surgery is for Huntington Beach women or men who are in good physical health and need to remove a large section of excess skin from the middle. Candidates for this procedure include people who often have to deal with loose skin after losing a considerable amount of weight, those who haven’t been able to lose the pooch with weight loss techniques alone, and those who have weak abdominal muscles after pregnancy. The extended tummy tuck is for Huntington Beach patients who have a large amount of sagging skin on their midsection, sides, hips and lower back. The surgeon makes an incision in the abdomen that reaches across the hips all the way to the lower back. This particular procedure almost always requires a liposuction procedure in order to drain extra fluids and remove excess fat cells. After this, Vu tightens the abdominal muscles, removes loose skin and seals the cut. Again, the belly button must be repositioned in order to accommodate the patient’s new shape and profile. Other Options: The procedures mentioned above are two of the most common. However, other options are also available. Endoscopic tummy tuck – This particular procedure leaves the least amount of scarring since it removes the least amount of skin and is performed with a small incision. Panniculectomy – This is also known as a fat apron removal surgery. Circumferential Abdominoplasty – As the name implies, this procedure involves a surgical incision that is made completely around the waistline. Though your results will be noticeable, there are still some things that an abdominoplasty won’t do. First, a tummy tuck is not intended to be a weight loss surgery. All of Dr. Vu’s patients in Huntington Beach need to be at or very close to their goal weight before they can be considered for this surgery. It is important to note that you should have maintained your weight for some time, typically six months, to be sure you are going to stay the course. Second, the procedure won’t eliminate all your stretch marks although some will be removed as the loose abdominal skin is excised. Finally, abdominoplasty is not a substitute for maintaining a healthy diet and exercise regime, but you will need to refrain from vigorous exercise during your recovery. Once Dr. Vu tells you its ok to exercise, it’s essential that you resume an exercise routine so that you don’t gain weight which will negate your surgical results. Also, maintaining a healthy diet is of utmost importance, before, during, and after your surgery. Many of our Huntington Beach patients have never undergone surgery before. And even if you have, Dr. Vu wants you to be confident that you are in the very best of hands. One goal of California Aesthetic Center is to give our patient’s as much information as possible to alleviate their anxiety in the weeks and days before their surgery. Below we have listed what the typical tummy tuck procedure entails. First, you’ll arrive at the surgical location having fasted for at least 12 hours. Fasting is essential because you’ll be receiving general anesthesia. Having anything in your stomach when you receive this strong medication may cause complications. Before you proceed to the operating room, you’ll be taken to a pre-op room where a team of nurses and medical staff will prepare you for your surgery. Some things you can expect while there include changing into a surgical gown and having your vital signs monitored. You will also have a hospital bed with a comfortable pillow, a sheet, and a warm blanket if you are cold. We would be remiss if we did not tell you how kind and attentive the nurses are and how quiet, calm, and soothing the dimly lit pre-op room is. When the time comes, you’ll be wheeled into a brightly lit, sterile operating room where Dr. Vu and his surgical team will be waiting for you. Again, you will be assured by his professional demeanor. An anesthesiologist will place a mask over your nose and mouth, and within seconds you will be completely unconscious. Once you’re asleep, Dr. Vu and his surgical team will perform your tummy tuck. When your surgery is completed, you’ll be transferred to a recovery room. This is where you’ll awaken from general anesthesia. You will be groggy and have all of the necessary bandages and other post-surgical needs in place and will be closely monitored to make sure you aren’t experiencing any complications. Once Dr. Vu deems it’s safe for you to leave, you’ll be released into the care of a friend or family member who can drive you home where will you can recover in the comfort of your own home. If you’re ready to have the trimmer, slimmer and more contoured belly that you’ll be proud of, it’s time that you take the next step and visit with Dr. Vu at California Aesthetic Center. During your initial consultation, he’ll examine your abdomen, listen to your concerns and goals, take a full medical history to be sure you’re a safe candidate for the procedure, and answer any questions you may have. 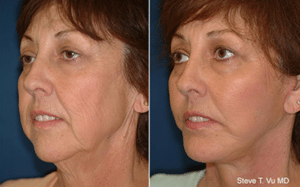 Call California Aesthetic Center in Huntington Beach today at (714) 848-1133 to schedule a consultation.